Eliot Spitzer and Scott Stringer, the two Democrats locked in an increasingly personal battle over who will serve as New York City’s next comptroller, brought their duel for progressive hearts and minds to The Tank, a performing arts space in Hell’s Kitchen on Tuesday evening, where liberal activists sipped beers as the two men were grilled in back-to-back policy discussions. 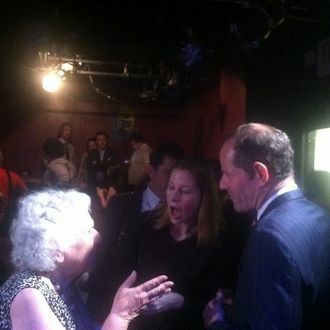 In contrast to their one-on-one televised debates, which have consisted largely of Stringer alluding to the “black socks” prostitution scandal that ended Spitzer’s career as governor (and Spitzer countering by pointing to the array of entrenched financial interests who along with Lena Dunham are backing his opponent), the candidates used this forum (co-hosted by Democracy for NYC, Living Liberally, and ACT NOW) to fill out their visions for how the office might be more of a progressive force than it has been under incumbent John Liu, the longshot Democratic mayoral hopeful. Stringer was the crowd favorite, not far from his Upper West Side stomping ground. He did his best to contrast his transactional style – he promised to be “a steward, not a sheriff,” referring to Spitzer’s reputation as the “Sheriff of Wall Street” – with the populist former attorney general’s more hard-charging approach, which some in the audience said made him a better fit for cable news (where he recently worked full-time) than city government. Both tried to assert their “Occupy” credentials, Stringer claiming that he was among the first of the city’s elected officials to visit the protests in Zuccotti Park when they broke out almost two years ago. But Spitzer seemed to get the better of that one when he was asked about Occupy later in the evening, quipping, “I kind of feel like I occupied Wall Street starting in about 1998.” The room erupted into giddy laughter and applause, a testament to the staying power his reputation as a foe of Big Finance has among the city’s Democrats (good enough to give him the lead in most polls).